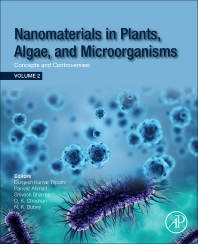 Nanomaterials in Plants, Algae and Microorganisms: Concepts and Controversies: Volume 2 not only covers all the new technologies used in the synthesis of nanoparticles, it also tests their response on plants, algae and micro-organisms in aquatic ecosystems. Unlike most works in the field, the book doesn’t focus exclusively on the higher organisms. Instead, it explores the smaller life forms on which they feed. Topics include the impacts of plant development, how different nanoparticles are absorbed by biota, the impact different metals—including silver and rare earth metals—have on living organisms, and the effects nanoparticles have on aquatic ecosystems as a whole. As nanotechnology based products have become a trillion-dollar industry, there is a need to understand the implications to the health of our biota and ecosystems as the earth is increasingly inundated with these materials. 13. Do nanoparticles possess ecotoxicological risks to the aquatic environment? Dr. Parvaiz Ahmad is Senior Assistant Professor in the Department of Botany at Sri Pratap College, Srinagar, Jammu and Kashmir, India, and is presently a Visiting Scientist at King Saud University, Riyadh, Saudi Arabia. He completed his post-graduate degree in Botany in 2000 at Jamia Hamdard, New Delhi, India. After receiving a Doctorate degree from the Indian Institute of Technology (IIT), Delhi, India, he joined the International Centre for Genetic Engineering and Biotechnology, New Delhi, in 2007. His main research area is Stress Physiology and Molecular Biology. He has published more than 50 research papers in peer reviewed journals, and 40 book chapters. He is also an Editor of 17 volumes (one with Studium Press Pvt. India Ltd., New Delhi, India; nine with Springer, New York; three with Elsevier USA; and four with John Wiley & Sons, Ltd.). He is a recipient of the Junior Research Fellowship and Senior Research Fellowship award, granted by CSIR, New Delhi, India. Dr. Ahmad was awarded the Young Scientist Award under the Fast Track scheme in 2007 by the Department of Science and Technology (DST), Govt. of India. Dr. Ahmad is actively engaged in studying the molecular and physio-biochemical responses of different agricultural and horticultural plants under environmental stress. Dr Dubey has won awards for both his teaching and his research, and is currently a fellow of the National Academy of Sciences. His work spans across botany and food microbiology. He has published over 160 papers and has contributed to 7 books, in addition to holding a number of patents.